Thursday August 24th 1893 I did not feel well today. Lizzie went to the fair this morning and came home very tired. We all slept some in the afternoon. I rode down town with Lizzie just before supper. Will put in a full day at the fair. I wrote home. Friday August 25th 1893 Will hitched to the Surry and took us girls a ride and left me over at Joe Woolfs. I staid a little while and Andrew took me down to Venes. Will came there for his dinner and we all sent to the fair.. Went back to Duncans for supper and spent the evening. So ends the fair and our pleasant visit to Delavan. 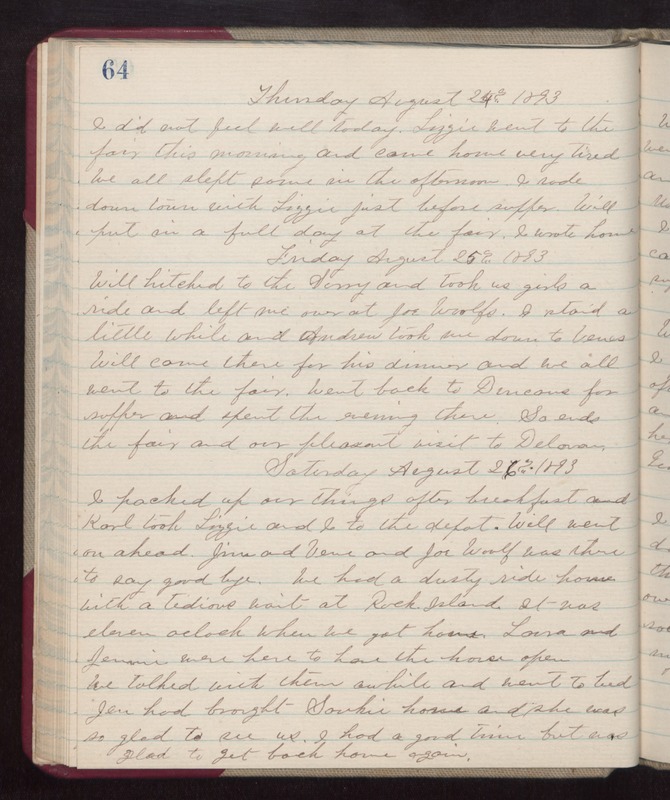 Saturday August 26th 1893 I packed up our things after breakfast and Karl took Lizzie and I to the depot. Will went on ahead. Jim and Vene and Joe Woolf was there to say good-bye. We had a dusty ride home with a tedious wait at Rock island. It was eleven oclock when we got home. Laura and Jennie were here to have the house open. We talked with them awhile and went to bed. Jen had brought Sankie home and she was so glad to see us. I had a good time but was glad to get back home again.